‘Sister Wives’ Star Aspyn Brown is Married! See Photos of Her Wedding! Another Sister Wives kid has tied the knot! On Sunday, Aspyn Brown–who is the oldest of Kody Brown‘s children with third wife Christine–married Mitch Thompson in an outdoor ceremony held in the Utah mountains. Aspyn wore a white satin gown, while Mitch busted out a Scottish kilt for the occasion. (Kody showed off his gams by wearing a kilt as well.) All four of Aspyn’s moms wore fancy hats to the wedding, with Christine all decked out in emerald green. Although Aspyn served as maid of honor for her sister Mykelti‘s December 2016 street-taco-filled wedding, and had previously stated that Mykelti would be her maid of honor, TLC reports that Aspyn and Mitch ultimately decided to forgo having a bridal party. Instead, they had 10 flowergirls. Mitch, who is a carpenter by trade, built the arch that he and Aspyn said their “I do’s” under. Mitch and Aspyn started dating after meeting at a pro-polygamy rally in Utah. (The Browns were shown attending the event during an episode of ‘Sister Wives.’) Their families have been friendly for years, though. The couple got engaged in December. Although both come from polygamous families, Aspyn and Mitch have stated they do not plan to live plural marriage. Wedding guests included Mitch’s older sister Vanessa Alldredge, her husband Jeff and their kids, all of whom star on the TLC reality show Seeking Sister Wife. Aspyn is the third of Kody Brown’s 18 children to get hitched. Mykelti and Madison Brown both had their weddings in 2016. 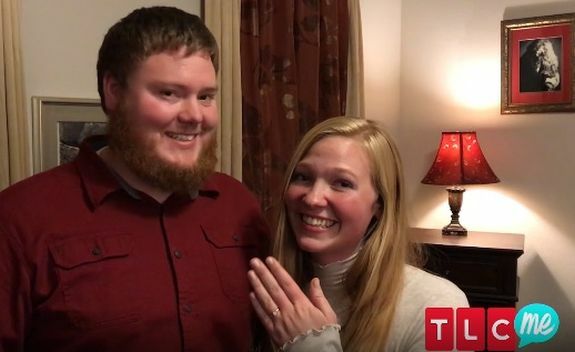 Aspyn and Mitch’s wedding will likely play a big part in the next season of ‘Sister Wives.’ As The Ashley previously told you, the show was recently renewed for another season. See all the photos from Aspyn and Mitch’s wedding day by clicking here! Oh… and a shout out the my Dad who has never let any of us doubt his love and faith in us! He also rocks the heck out of the kilt! ?????? Love you Dad! Super fun incredible day to celebrate my sisters wedding. Ashley I have watched Sister Wife’s each season. Not at all looking forward to the new season. I can’t stand Meri. Whinny poor me Meri. Aspyn seems like a very sweet girl. I hope she’ll be happy. What I would love is for Solomon and Truely to have a spinoff show. Those two have more personality than the entire rest of the family. They are both super cute too! Aspyn looked absolutely beautiful. IMHO she looked more classy, beautiful and even more bridal than her sisters did at their wedding. Meri & Kodi looked to me in the family photo as if they made up from what I could see of their body language and proximity to each other. Has Kodi ever mentioned Scottish ancestry? Wonder what plaid he’s wearing. Though it wouldn’t surprise me if he just picked a plaid he liked and didn’t concern himself whether he was a member of that clan or not. Thought the first time ne didn’t go through so I wrote the post out again and then when I posrted the 2nd that’s when the fist showed up. It really is that kind o fun a day today ????? Aspyn looked absolutely beautiful on her wedding day. Totally blew her ssisters out of the water (IMHO) in comparison to how Madison & Mykelti looked as brides. Her wedding looked a little classier from the photos. I wonder if Kody & Meri made up as she is not only standing next to him in the family photo but also touching his arm. I wonder which kilt Kody was wearing. Has he ever mentioned any Scottish roots? wonder when the boys will start getting married? Kaveman Kootie in a kilt. Revolting. It’s absolutely beautiful and about as far from her sister’s wedding as she could get. I’m speechless looking at the wives picture… the dresses… the HATS!!!!! Me too ! I thought they looked ridiculous! So is there any truth to Meri finally doing the smart thing, and truly leaving this hot mess of a “marriage”? I hope it’s true. Live your life happy. Life’s short. Enjoy, find real love…. i,wish I could get ingo on if this is true. Anyone?? The way she was standing next to Kody with her hand resting on his arm in the family photo doesn’t say “leaving” to me. Aint’ it something that NONE of the kids want to live in a plural marriage? I thought Meri left the family. Is that true?? This one will be easier to watch. Aspyn doesn’t seem super entitled like Mykelti. Mykelti got married TWO years ago….? I feel like I just lived through that s**tshow last week. How is Sister Wives so far behind on the show? And her husband still hasn’t cleared that bubble in his throat that he talks through. Kody really couldn’t do something with that mop on his head?! I know ! Does he actually think he looks good ? What an idiot ! He looks like a Fraggle. The views at their venue look amazing. Also, this seems like a much classier affair then Mykelti’s taco-fest. Speaking of, Mykelti looks particularly pressed at Aspyn being the center of attention.